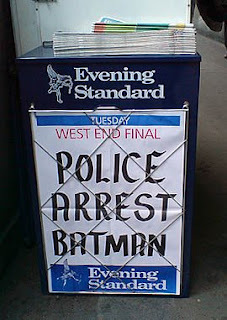 Dire news: Batman, the superhero with the combined powers of a man and a bat, has been arrested for killing a man with his Bat-breath. He may be a bat, but he is also a man which makes him punishable under human law. You may ask "why doesn't Batman just fly off?" Well this is impossible as Batman's wings have been clipped as part of his parole agreement. Yes, Battie has already been arrested once after it was found that his Batarang violated weapon laws. This latest discrepancy could land Mr. Batman, who is rapidly descending into alcoholism, in hot water with the authorities. May this be a warning to you all - do not kill anything, not even flies, or the law will come down on you like a lead piano. I'm looking at you, Slightly Below Average Man!